It is impossible to linger over Peg Boyers’s poems without consciously considering one’s own experience – even where subject matter and point of view seem to indicate singular personal history i.e., the particulars of being a mother and a daughter, of being a Christian, an expatriate, etc. 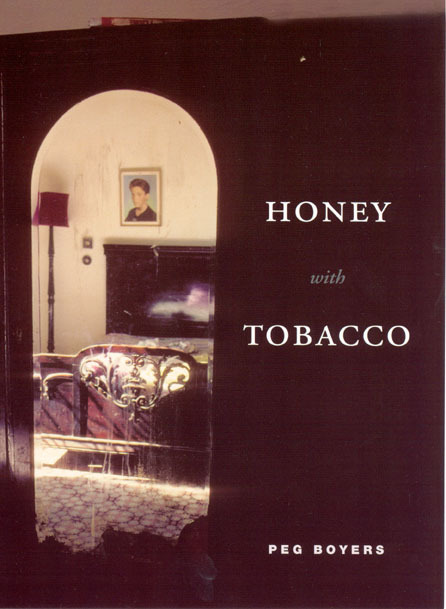 Poems in Honey with Tobacco move from those particulars to universal truths just as they move from dream-like states to awakenings. The parallel is significant in revealing the unity that is our purpose for being, our sanity and the “why” of our poetry. Consider the final poem, “Forty Days,” in a volume basically composed of three chapbooks. The treatment of the well-known and accessible Hieronymus Bosch painting describes human experience as having quite a lot to do with fear. In order to articulate and elucidate the Bosch masterpiece, Boyers demonstrates, one must become the painting. I have even spoken aloud on several occasions about seeing that world as a Hieronymus Bosch painting. So, in this case, Boyers’s particulars are eerily particular to me as well. There is at least one other example in the book that is "too" familiar but these exceptions, I shall demonstrate, are not exclusive in their power to move this reader. The secret, in other words, is not in the cut of meat but in the sauce. Furthermore, I believe that many people can readily relate to the Bosch painting as if it were a contemporary work. As a colleague pointed out, “the United States is a nation obsessed with recovery and healing.” The key to poetry and healing comes from within, rather than looking “at” from the outside. Looking “at” the painting is somewhat akin to the cliff-perched holy man in Black Narcissus: Enlightened but also mute and therefore getting the best view but in no position to write poetry. Of course one cannot be entirely apart from the striving and desires of humankind and write poetry. Consider the songwriter as one who lowers him/herself so as to detect and record the vibrations on the surface above, how the most passionate and healing writing flows from a deep wound almost automatically, as if the self-censor has been somehow slain, an idea articulated in a Richard Thompson song, “When the Spell is Broken,” in which the total yield of emotional investment in a relationship is a “token.” The songwriter reaches heavenward. This is art and humility. Creating from the vibrations underfoot, perhaps deigning to stoop a bit, is, for the purpose of this example, laziness and arrogance. Simply put, one has to face the fire to produce the art which is the key, the lock and the door to liberation. And that, I think is the real problem with poetry that falls short of the high achievement of Honey with Tobacco: Many would-be poets simply lack honesty at certain depths. Oh, yes, you can be honest in your dealings with other people but not so honest with yourself, at least at the level where the things that "count" in poetry reside. This is stuff of the "unexamined life" and the "life not lived." On the other hand, a reaching heavenward from humility may, at best, be an imperfect state. H.D. noted that Christ was too busy being Christ to be a poet or writer. Higher love, dare we speak of it, dispenses with all forms of connivance, including art, which may seem a bit confusing until we realize that art is a means to an end and not the end itself. One might as well consider those literary “saints,” or, at least, muses and martyrs of various literary and Bohemian circles who produced scant literary or artistic output themselves. They, too, were busy “doing,” rather than, recording. Boyers’s poem comes from inside the painting, then, as a certain understanding that Hell is a product of the mind. Take it one step further, as some have suggested, and say that Hell is the mind. "Boss of the Blues" Big Joe Turner's legend continues as short film is completed -- 22 years after early computer animation scenes were made. This short film illustrates the power of good conversation on the human imagination by exploring the slapstick possibilities of even a very slight deviation from an itinerary. 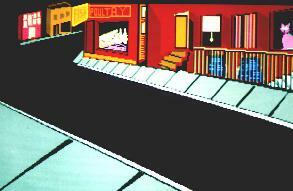 Given a limited set of tools (an Amiga 500 computer lacking a hard drive) and an anamorphic animation program), the creator devised a simple strategy: Use a maze as an ironically unifying element as it serves to link story elements even as it seems to come between the subject and his goal (dinner). All the same, it was quite a delay between the initial Amiga computer project and the short film we see here. More than a quarter of a century lapsed before a finished project was assembled on a laptop computer. The original soundtrack was finally edited and overlaid with acoustic instruments. Cartoon stills were added and a somewhat faster pace established with a larger number of images. “It's just an "Ol' Dan Tucker" kind of song that lent itself to illustration ... given a certain respect for jazz and blues music … yet with desire not to take one’s self too seriously,” said writer/producer/animator Robert S. Preuss, who began with a tune he composed for folk coffeehouse comedy. “Obviously reality yields to imagination at the end of the first verse of the song; however, the last verse is based on a very famous real-world newspaper editorial cartoon so the viewer is not left without a ride from Oz back to Kansas ... City." Working without a computer hard drive meant disk swapping: Exchanging the animation program disk for 3.5-inch floppy storage diskettes. Al McKenney, whose anecdote launched the song and the film it inspired, has served the music community in various capacities. He has been a record producer (Bruce “Utah” Phillips); road manager (David Bromberg); festival emcee (Clearwater Festival, Kent State and Smithsonian Folk Festivals, etc. ); folk club operator and radio deejay (“Captain Fun’s American Gumbo”). He is a resident of Saratoga Springs, NY. Robert Preuss edits Poets Collective. Click here to view this intriguing dance film. Click here for Clews's discussion of the dance. In a society of broken boundaries — families, roles of institutions (education versus family, etc.) and individuals (gender roles, etc. ), etiquette, attire, speech and personal conduct, the printed comic seems to offer a quaint oasis of restrained creativity. As such, it’s ironic that certain “mommy” stereotypes include banishment of the comic book as a time- or mind-waster. Time to get over it. Whether the plots are finite or serial, the two dimensional “panels” generally provide both the security of well-defined space and at least some element of closure. Paradoxically and due, in large part, to the limits of two dimensions, black and white ink or “flat” coloration, the medium appears to be inherently subversive: An implicit lack of depth (with the assumption that the content must also lack depth) tends to reduce its elements to caricature. Given this almost contradictory combination of restriction-rigidity and subversion, one could push it a bit and say that the comic is a “bipolar” art form. This may not seem entirely out of line with the human “bipolar” experience of daily life! It might be argued that neither a depressive nor manic “phase” can allow for full-spectrum perception, the abundance of life that accompanies peace of mind, except in those moments we lazily and tiresomely call “epiphanies.” Similarly, the comic offers a “base,” limiting experience — instead of the full spectrum solar brilliance of art and storytelling through the fine arts and literature, it gives us but a small, wintry slice of the highlights. The comic thus bears a natural penchant for deviltry, a Shiva-like destruction of forms via reduction to the least flattering elements (consider G.B. Trudeau’s treatment of Hunter S. Thompson as one of the better-known examples). In short, the comic, which may be justly called intensely Saturnine, is an embodiment of the most basic sort of creative tension, the kind that resides within the medium itself. So now the most natural thing to do with a comic panel must be to build on that foundation of creative tension. Throw a bunch of kids into it! Kids embody the robust Jupiter of astrological psychology, of growth through expansion. Maturing through constraint — that’s Saturn. And that tension is, rather basically, what makes the comic go ’round (or, rather, go square). Apropos of constraints, I very much doubt young children are actually “testing” their boundaries or limits as they grow — more likely they are testing their parents’ limits. We tend to project a bit about such difficult matters. Kids, in fact, have a way of imposing their own constraints: They mimic and they play at roles, make believe they are their heroes. The age of heroes is finite, however. Consider that ancient Greece’s heroic period (Second Bronze Age) ended as the Iron Age began ... “A glory had forever passed from the earth of which we today have only the faintest intimation ...” (Donald Richardson, Greek Mythology for Everyone: Legends of the Gods and Heroes). If we accept Sigmund Freud’s notion that, “the childhood of the individual is the childhood of the race,” it follows that children must eventually transcend the limits of role playing and outgrow their heroes. Formalized role playing — commercial games such as Dungeons & Dragons and others — appears to be more than just a hobby for the kids in Snapdragons (Dork Storm Press, 2006), a comics collection in which role-playing and storybook fantasy converge at a gateway to new possibilities. That combination is certainly non-exclusive. As the artists are, essentially, examining the creative process, the collection of comics presents some very complex and interesting approaches and ideas worthy of study. Commercial role playing games seem to form the characters’ Weltanschung, Whether the kids are playing indoors or out, playing dress up or simply exploring new spaces, the Snapdragons kids’ use the language of these games. From the standpoint of astrological psychology, which at least affords us some useful language as applied to creativity and the arts, we are speaking of the realm of Mercury, said “to govern the way the mind directs its thoughts and connects reason between the conscious and the subconscious, physical and the spiritual” (Deborah Goulding, Skyscript: “Saturn, the Great Teacher,” December 2003). This will become very evident in Snapdragons. It appears (however alarmingly) that a growing number of people find games, typically electronic, to be a principal “connector” in their lives. Electronic games form an entertainment medium so powerful that those embracing it will line up outside of stores hours before early morning openings when new gaming systems become available in limited supply. Commercial role-playing games have been around since Gary Gygax (Tactical Studies Rules, TSR) first published Dungeons & Dragons in 1974. To the uninitiated, however, the role playing gamer may seem even stranger than the rabid video gaming enthusiast. Animated motion picture storyboard artist/illustrator Liz Rathke and gaming writer/publisher/comic artist John Kovalic have, in Snapdragons, succeeded in demonstrating that the games are basically structured versions of the kind of play that kids do naturally. Subversive? Well, wisecracks (school cafeteria meatloaf is “fugglier” than zombies) do layer the collection. While whimsy abounds, as it should, this particular comic series addresses the creative imagination itself in a caring, patient manner, which suggests the book’s potential usefulness to parents hoping to understand and foster creativity in their children. Creative kids create their way out of boxes (much like comics creators), as Snapdragons demonstrates in a most ambitious twist on Maurice Sendak’s evergreen, Where The Wild Things Are. Here play intrudes on homework and chores. By putting her foot down, Mom, not merely moves to maintain decorum, but effects a full-blown existential dilemma — in effect, she becomes Shiva, unleashing creative/destructive forces. The twins use their imagination to sail (consider Hermes/Mercury, a guide to travelers, in the mythic tradition of the far-off adventure) to where the “Wild Things” might be hanging out. Things take an ironic twist, or rather, several of them. The creators of the comic don’t simply reference Sendak. They perform a full-scale détoumement, re-conceptualizing the images, message and artefacts they’ve lifted from the original. Here is pure drollery: To these modern-day gaming kids, Sendak’s creatures just aren’t frightening. They are, in effect, mild things. Jody and Jake recruit the monsters for (what else?) play in imaginary video, card, and board-based games based on the kids’ real-world collection (at this point one recalls the late Fred Rogers who took great pains to clearly mark the border between reality and fantasy play). Furthermore the kids’ gaming thoroughly befuddles Sendak’s not-so-nightmarish creatures. Rathke’s visual rendering of the exasperation of the creatures is arresting and endearing in this high moment of deconstruction. What we have in effect is ... drum roll, please ... a “role-playing reversal” in which the children become the “monsters” and the monsters are overwhelmed. This is a Leonine twisted circle, however. There is one more sleight-of-hand. The imaginary creatures, it seems, have their own imaginations. Their way “out” of this "Ransom of Red Chief” quagmire is to convince the kids that their mother is calling and hasten to send the children home. We could creatively apply a term created by Bertolt Brecht for this particular plot twist: Umfunktionierung, a creative solution addressing a new “reality” or set of circumstances defining the rules of this particular fictional universe. This, in turn, creates a kind of cognitive dissonance visible on the faces of the children “crossing over” once again. This solution not only highlights the artistic necessity of creative tension (the creative Sun against the female principle of Saturn ... “everything that arises from its influence carries the aim of creating firmer foundations for future potential” -- Goulding, again), it provides a kind of analogy to healthy child development in which the imagination and mundane reality are balanced. Ironically enough, it is only by playing the restrictive “Mom” trump -- hence invoking Shiva — that the “Wild Things” can be truly wild once more. And that is a very special, healthy minded moment, in a growth adventure for children and their parents and for those of us risking our reputations to examine the creative process wherever it occurs. Not only is this tribute worthy of Sendak and suggestive of magical realism, but, in all its glorious, comic subversion, points to a postmodern vision. This vision honors the early 20th century Modernist view of the art escaping from the artist-as-prison by figuratively recapturing it; thus the vision appears to be liberated from the internal logic of the work of art itself. In this very attempt to “corral” or “label” it, though, we appear to be reaching into the abyss ... Mom?